Vice President Joice Mujuru and her side- kicks in the Zanu-PF Politburo planning to assassinate President Mugabe were conspicuous by their absence at the official opening of the party's 6th National People's Congress yesterday. The congress, attended by more than 12 000 delegates, was officially opened by President Mugabe, the Zanu-PF First Secretary. VP Mujuru's allies who also failed to attend the crucial party congress were secretary for administration and Presidential Affairs Minister Didymus Mutasa and party secretary for transport and Public Service, Labour and Social Welfare Minister Nicholas Goche. 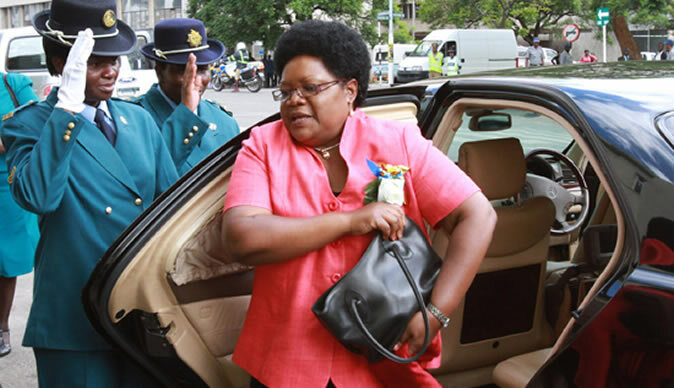 The failure by VP Mujuru to attend the congress effectively sealed her political fate after she failed to land a seat in the Central Committee. Mutasa is reportedly seeking medical attention in South Africa, while Minister Goche is reported to be hospitalised at a private clinic in Harare, with both said to be suffering from hypertension which developed soon after they lost in the Central Committee elections. Other notable absentees were Politburo member Engineer Munacho Mutezo, ousted Mashonaland East provincial chairperson Ray Kaukonde and other provincial chairpersons who were booted out through a vote of no confidence by their executives recently. Politburo members who recently courted controversy through their support of VP Mujuru's machinations - Cdes Tendai Savanhu, Charles Tavengwa, Kudakwashe Bhasikiti and Webster Shamu - were present at the official opening. Speaking on the absence of VP Mujuru and Mutasa at the top table, President Mugabe told delegates during his official opening speech that the two were like thieves who disappear without saying a word. "Munoona tinemagwanza nhasi pamusoro pedu apo. Vamwe vedu varipi?" he said. "Hatina kuvatanda. Hatina kuti regai kuuya. Tanga tatoti vauye muvaone munzwe zvavanotaura. Kungosvotoka vasina kutiudza kuti chii chaita kuti varovhe? Ndiwo maitiro embavhaka iwayo. (We have gaps at the top table. Where are the others? We did not bar them from coming. We wanted them to come and explain themselves, but they went away without saying anything as if they are thieves). Delegates who spoke to The Herald yesterday said those who were absent at the official opening of the congress confirmed the allegations they faced by their actions. VP Mujuru and her allies have been accused of plotting the assassination of President Mugabe to pave way for her to take over the presidency. Incoming Central Committee member Paul Mangwana said the new Constitution guarantees freedom of association and disassociation. "Freedom of association is enshrined in our Constitution, so it is their democratic right to disassociate or associate with Zanu-PF," he said. "Our Constitution guarantees us that right. But their absence has confirmed allegations that they wanted to assassinate the President. In fact, they have never refuted these allegations and their absence is a clear admission that they wanted to unconstitutionally remove the President." Mangwana added: "Considering that they have been exposed, it was foolhardy for them to attend and any normal person was not going to attend. It is their choice to disassociate with Zanu-PF and they have a right to join other political parties or to form their own, but most importantly most of them have farms as a result of President Mugabe's vision, they can go home and farm". Harare province political commissar Shadreck Mashayamombe said the party was going to emerge stronger after the congress. "After this congress, we are going to move from cell, ward and district uniting our people," he said. "Those who have been defeated but are loyal cadres of the party must continue serving it in whatever capacity. There is time for everything." Tendai Wenyika, a member of the Youth League, said: "It is unfortunate that we have colleagues who have decided to boycott this important event and now we are forced to interpret their absence in a different way. "This is a sign of defiance and it goes against the spirit of loyalty, but we all know that their absence is a non-event. We will continue to support our revolutionary leader, King of Kings, President Mugabe."